Do you remember last year, same time? I was explaining you the popular French dicton, saying ” En mai, fais ce qu’il te plaît “, in May do what pleases you. Last year, I challenged you to do an activity you are passionate about in French! This year, I have another special challenge for you! 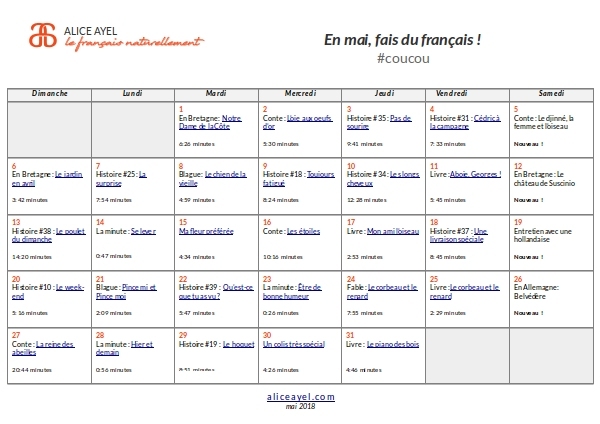 I have created un calendrier du mois de mai, a May calendar. So far, you may think there is nothing special about a calendar.. Well, this calendar is special because each day of the coming month, I challenge you to watch one of my videos. Focus on comprehensible French input everyday! Listen to a fun story. Discover a beautiful part of France. Read a book with me. Listen to a magical tale. Download the calendar or save the picture to your device. Invite a friend or loved one to join you for the month. I will also assemble the playlist on YouTube on Monday 30th April so you can start on Tuesday 1st May, which is by the way la Fête de Travail, Labour Day in France and all over Europe… So logically, people don’t work on that day! I have to confess, I copied my number one yoga teacher, Adriene. Each month, she publishes a calendar with one yoga video for each day of the month. It really helps me to keep up with my yoga morning routine. I thought it would be brilliant to do the same with French and that is why I came up with ” En mai, fais du français ” (do you like the play on words?). So to recap, there is a YouTube playlist on the channel. You can save the calendar and check off each day as you go or you can follow along with the playlist. The new videos (or Nouveau !) are released on Saturdays. When you have watched a video, share it on Social Media with #coucou. That way, you make yourself accountable and we can support and motivate each other! I am super exciting about this and I hope you are too!!! I hope to see many #coucou from next Tuesday on! This week, I continue my little voyage in the beautiful Bretagne. And I take you to a capel which is very dear to me and my family for many reasons (my in-laws celebrated their 40th year anniversary there). To understand France and the French, you have to visit the many religious sites: capels, churches, cathedrals because before la Révolution française (which had its positives AND negatives), France was governed by kings and queens who referred directly to God. France was la fille aînée de l’église, the eldest daughter of the Catholic Church. It meant France was the most faithful country to Rome and the Pope. The French before becoming laïcs, secular were Catholic. That is why it is so important for me to share the religious aspect with you. It is also important to share it with my family. As you know, we live in Germany but I want my children to know where they come from, in order for them to know where they are going. I am forever grateful to my parents, family and teachers to have taught me about the religious symbols and history of France. So that, when I visit a church, I know what is what and who is who. It is a bit like a detective game, we enter a church with my children and we guess who is the statue or who is on the painting by the symbols they are wearing. Because as I mentioned in a previous post, a language is much more than words, it is a culture, a tradition, a history. All that to say that in this new video, I take you to an adorable capel and I explain to you some of the symbols of catholicism. I hope you enjoy it! I love hearing from you so let me know in the comments if you have a special place (church, museum, park…) worth the visit? 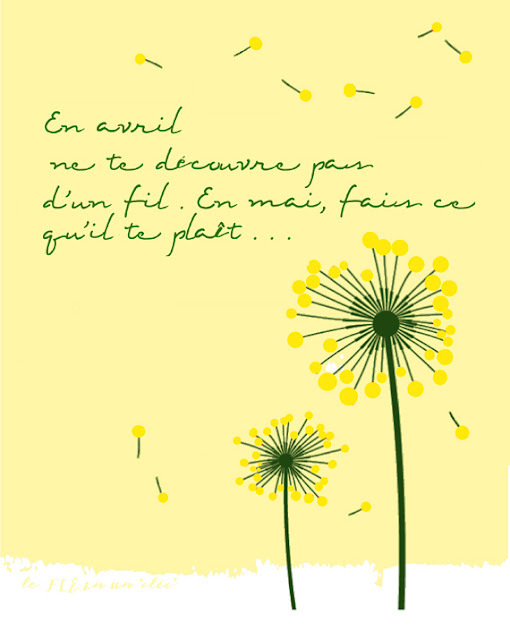 < French the natural way: youpi, c’est le printemps !